After a few days of battling the fog and snow in Sequoia National Park we took the short drive to cross the border into Kings Canyon National Park. Like with Sequoia, we had big plans for hiking in the beautiful, sunny valleys of Kings Canyon and exploring the granite cliffs and meadows. 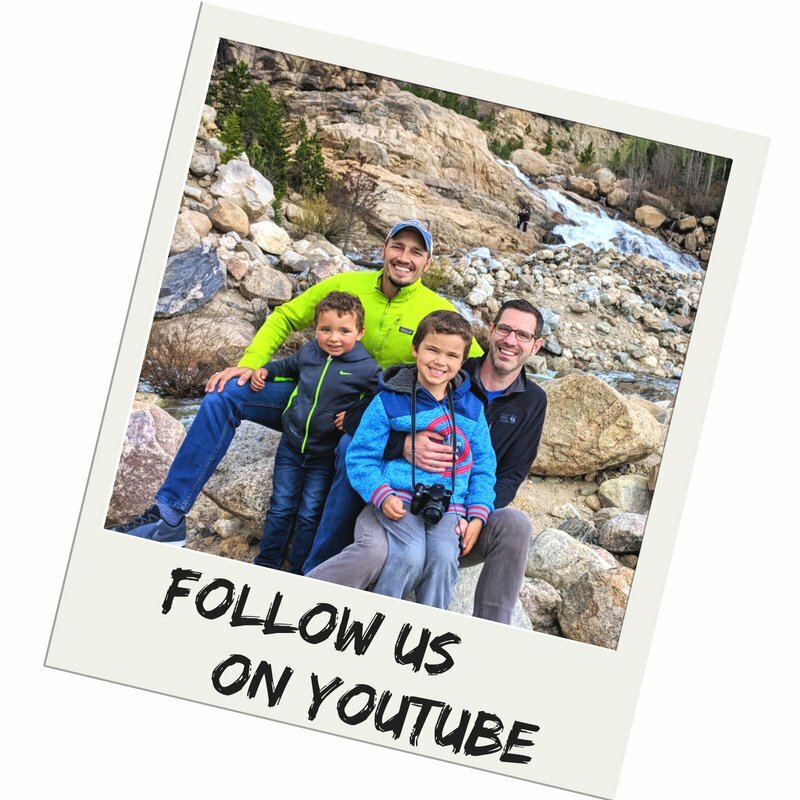 We were booked into the John Muir Lodge and excited to have some more challenging hikes than we’d had while staying at the Wuksachi Lodge in Sequoia National Park. Well, the best laid plans of man, right? It was the tail end of the random high sierra snow storm, so the weather was still chilly and overcast. The roads were still iffy and many still closed from the snow. Thank goodness the John Muir Lodge was is a clear area and close to an awesome sequoia grove. And hooray that Grant Village was close by so we weren’t at risk of taking a jaunt and getting stranded. 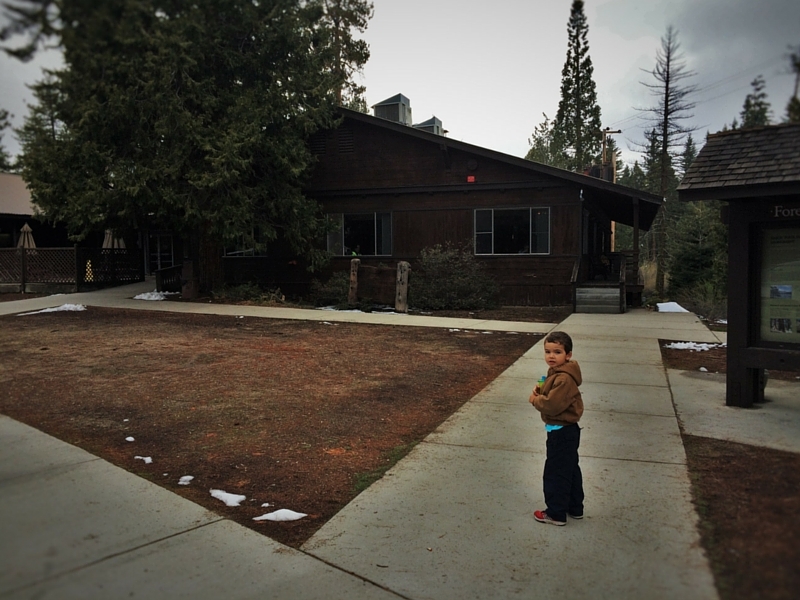 The John Muir Lodge welcomed us and we got settled quickly. It was nice to know that we didn’t have to trek through the snow again to have some relaxing fun, but then also it was nice to just relax there. 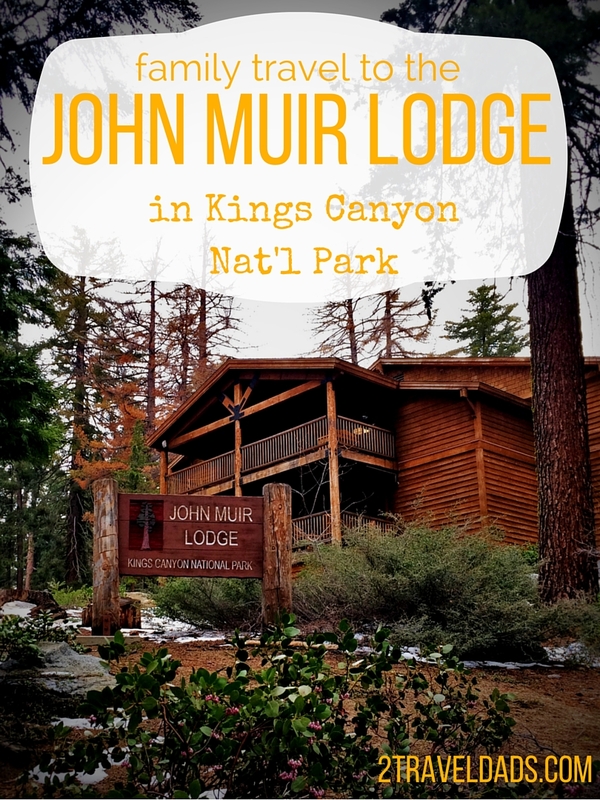 The John Muir Lodge is centrally located in Kings Canyon National Park. I can only imagine that it’s an ideal place to stay to fully enjoy all aspects of the Park, but since we were snaffued by the snow storm, we can’t rightly say. It worked out just right for us though and for what we were able to do while visiting Kings Canyon National Park. This is the handiest little hub of a place. It’s the equivalent of Lodgepole in Sequoia National Park or Canyon Village in Yellowstone National Park or Many Glacier in Glacier National Park… Do you get my drift? 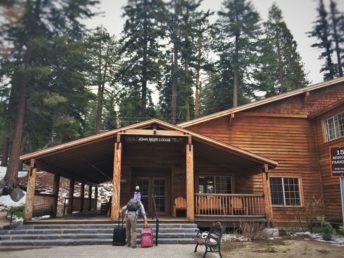 Grant Village in Kings Canyon National Park has the following useful services: grocery store, gift shop, Grove Dining Room, post office, showers, rangers… and a Visitors Center. The Grant Village Visitors Center is a cool one. 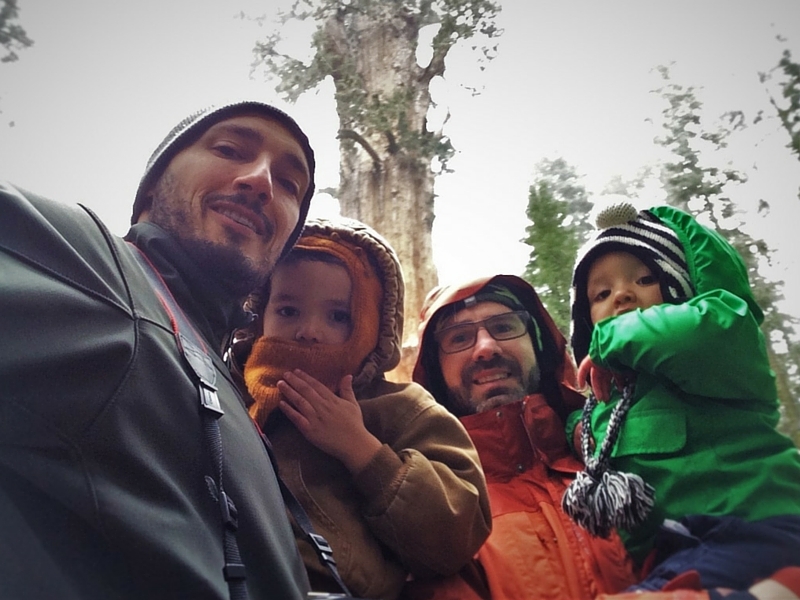 We were able to get our National Parks Passports stamped and then learn about Kings Canyon National Park and the many things we didn’t get to do because of the stinkin’ stupid &*$%#& snow. 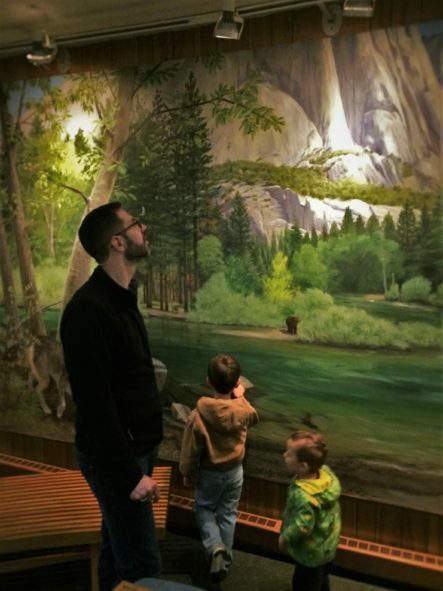 We did very much enjoy learning about the wildlife and the gem of the Visitors Center… the MURAL ROOM. OMG. Have you ever let a toddler run free in a room that’s 100% mural with sound effects? 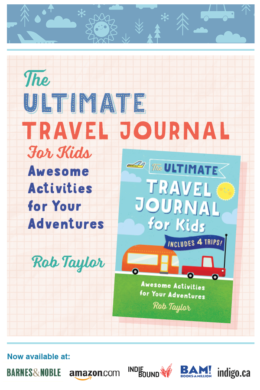 It’s the best and most happy happy joy joy experience. We loved it! 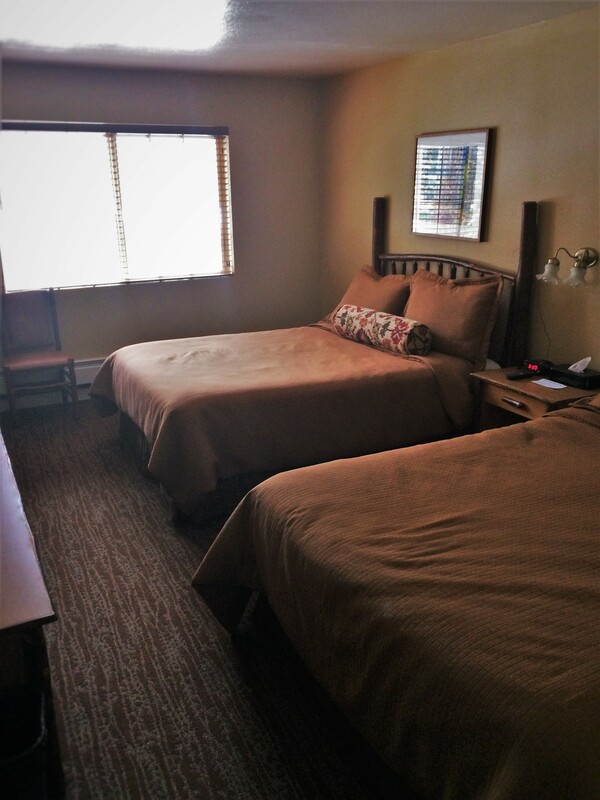 The John Muir Lodge has lots of great spots to relax. Want to stare off into the woods and wonder what’s out there? 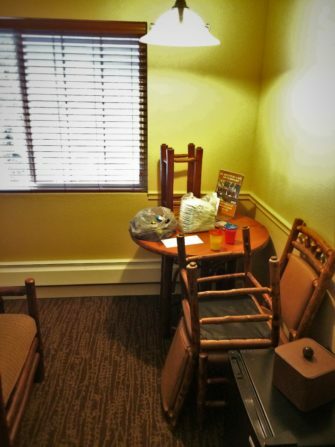 There are rocking chairs for that. 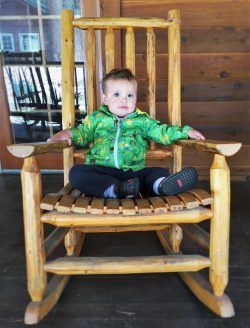 Want to watch the campers and other lodge-goers wander to and from Grant Village, there are more rocking chairs for that. 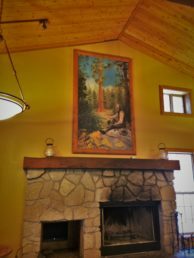 And then there’s the lobby with the awesome rustic furniture, board games and wonderful fireplace crowned with a beautiful painting of the man himself, John Muir. Since it was the end of the snow storm, the fire wasn’t lit but the lobby was still cozy. 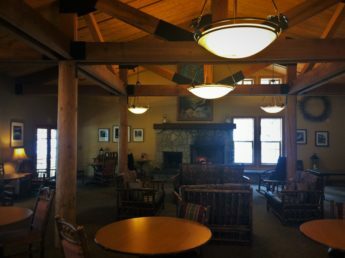 Tip: if you’re facing bad weather and have a wonderful National Park lodge to relax in, do it! 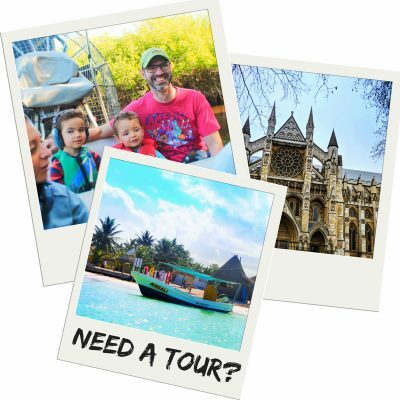 We’ve taken full advantage of the lodges of Mt Rainier, Yellowstone, Glacier, Sequoia, Oregon Caves, Olympic National Park, Yosemite, Bryce Canyon, the Grand Canyon… OMG. So many wonderful lodges to enjoy! 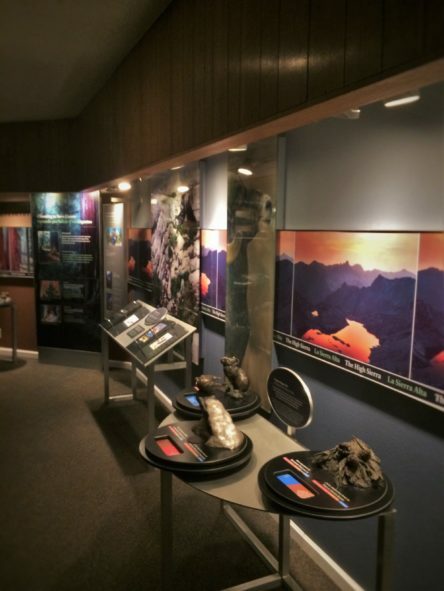 The John Muir Lodge was a bit different than the Wuksachi Lodge. 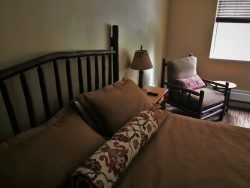 While the mood and energy of the guests at the Wuksachi and all of Sequoia National Park was excited and ready to roll, things were a bit more laid back at the John Muir Lodge. The guests were calm and quiet, the staff was calm and quiet… it was like we were in a quiet forest. 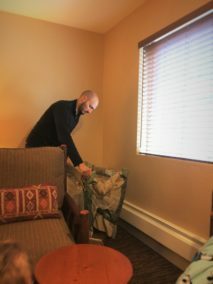 Upon arrival we were given a nice room with two queen beds, which would’ve been great… if we didn’t need to fit a crib. As it was, the only option for where to place the crib was right against the heater. No problem though, as we went to the front desk and they moved us into a room with a king bed and more floor space. True, we were down a bed now for our oldest, but we’ve had to make a nest for him before… and we did it again. Tip: if your room doesn’t provide for the right space for a crib or pack’n’play you can always rearrange some furniture. And remember about not putting anything too close to any type of heating unit. 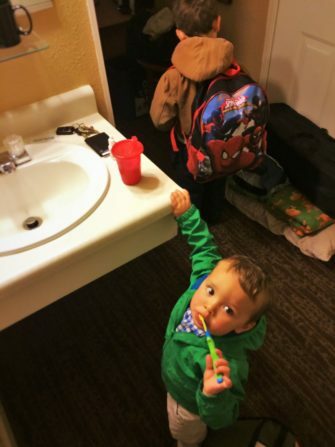 Making a nest for a kid is a funny thing to do, but it’s all too much a part of family travel. We’ve done it in super nice hotels and little last minute motels. 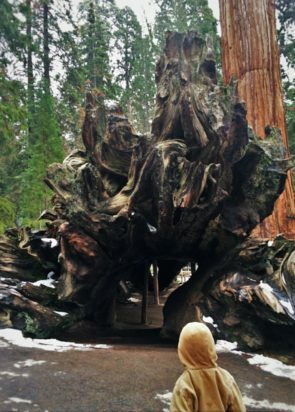 If only the John Muir Lodge had another option, we would’ve loved being able to give him a better bed for the night, but he didn’t know any better and enjoyed pretending to be a squirrel in a sequoia grove. On the actual bed, the bedding was comfortable and there were sufficient pillows for us pillow hoarders, which is always a good thing. Tip 2: ask to be away from the stairs, as we were directly next to them and although the stomping tromping kids did go to bed at some point, they were loud while they lasted. The John Muir Lodge was plenty quiet once people calmed down for the night. Note: we did have to use our own crib as the one they delivered to us was more of an infant bassinett and there was no way any baby older than 6 months could’ve slept in it. Later, a staff member told me that she thought they may have a larger crib, but it was too late for us to worry about it. Lesson: always travel with your own pack ‘n play in case there’s not one available (the Chateau at the Oregon Caves didn’t have any available at all). The Grant Grove Restaurant isn’t located IN the John Muir Lodge, but just down the hill in Grant Village. We dined there for breakfast and lunch, and then ordered to go for dinner. The atmosphere of the Grant Grove Restaurant is very lackluster and similar to a mid-grade retirement home dining room. 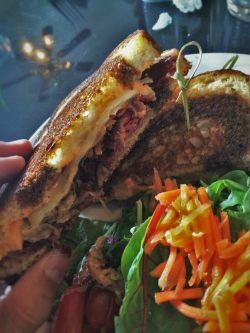 The food is good and I can genuinely say that the Ruben sandwich I had for lunch was by far the best I’ve had in years, with perfectly crisped corned beef and plenty of kraut and sauce. Also, the biscuits and gravy we had at breakfast we’re quite exceptional. Funny story: with family travel you start to see a lot of mac ‘n cheese and it really can run the gambit from great to gross. 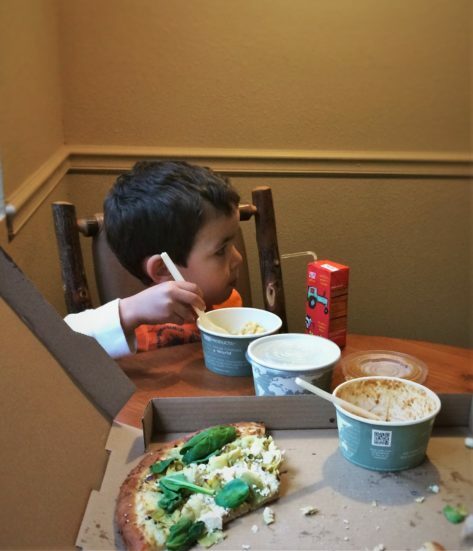 Our oldest ordered it at lunch… and then begged to go back to the Grant Grove Restaurant for dinner so he could get the mac ‘n cheese. As an adult palate, I can state that the dish wasn’t 5 star good like the mac ‘n cheese at the Inverness Hotel, but it was also not your standard. 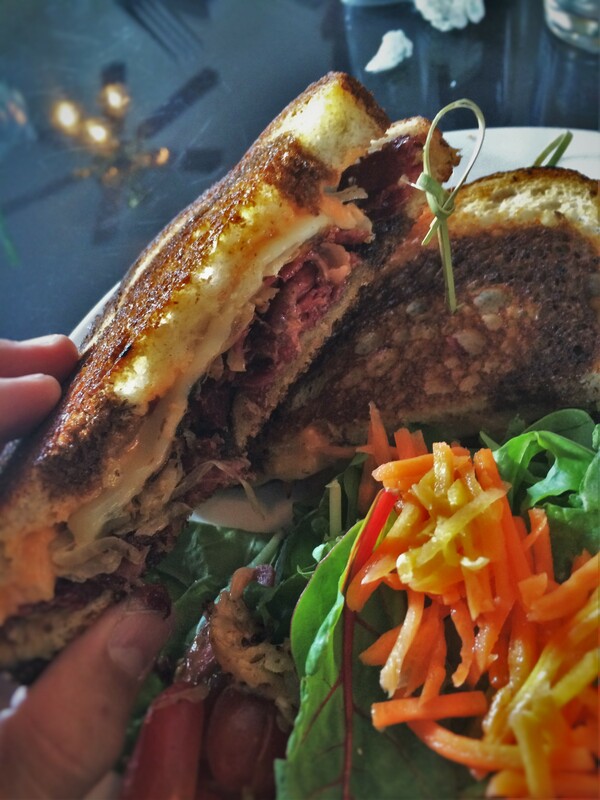 We’re always glad to find a kid-food like this. Oh yeah, and he asked for it at breakfast too, but it wasn’t available. The other thing we appreciated at the Grant Grove Restaurant was the fruit portions for the kids. They were generous and a good variety. 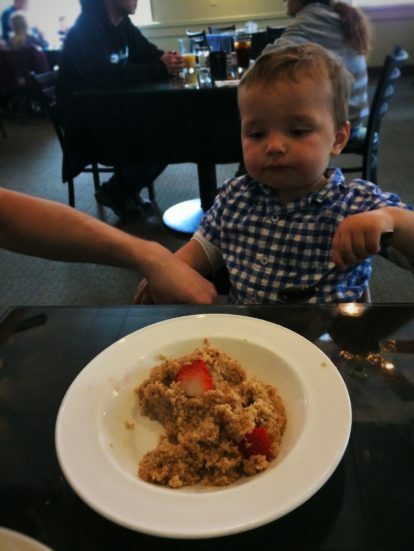 Oh, and the oatmeal was garnished with fruit too, so it was a double win. 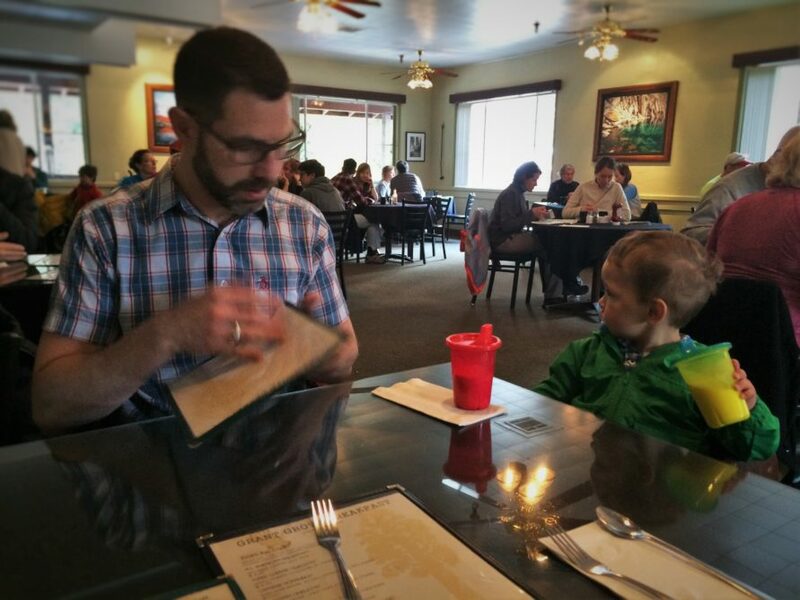 Regarding the overall experience of the Grant Grove Restaurant, we can say that the service we had was great and Oliver, our oldest, even invited our server on the rest of our trip with us. 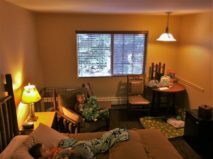 As far as cleanliness and atmosphere, it needed more that a surface wipe down and almost anything could’ve made the dining room more attractive. 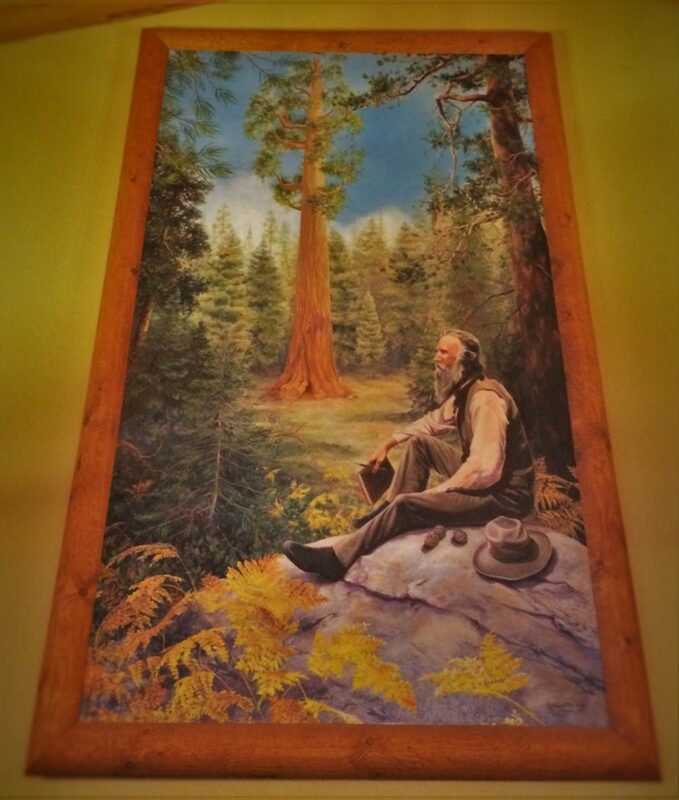 Note: the website for the John Muir Lodge does state that the Grant Grove Restaurant is undergoing a complete overhaul this summer, so we’ll see what changes in the coming months. 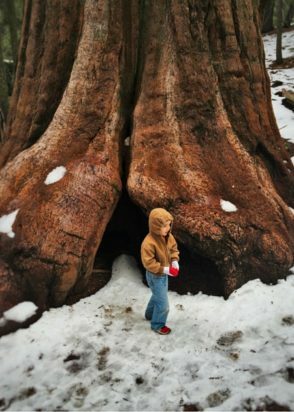 We only did one major activity while in Kings Canyon National Park due to the snow storm, and that was exploring the Grant Grove. We really enjoyed the Giant Forest and General Sherman areas of Sequoia National Park, like, really enjoyed them a ton. The Grant Grove was totally different and just as interesting. Allotting one to two hours for the Grant Grove is all you need to be wowed by this awesome area. 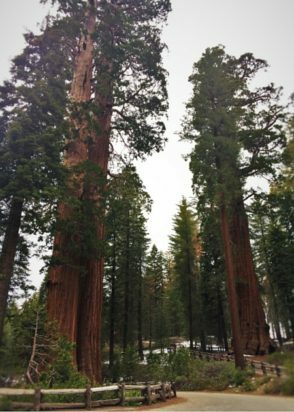 If you’ve already done Sequoia or the Redwoods you’ll find the trees and forest environment of the Grant Grove in Kings Canyon National Park to be exceptionally different and, well, just trust us that it’s great. 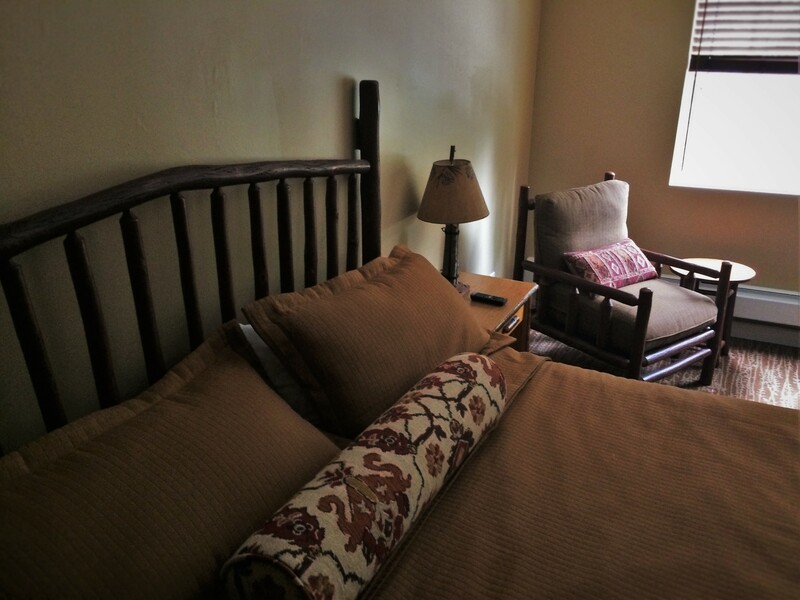 If you’re staying at the John Muir Lodge in Kings Canyon National Park, you’ll be in the perfect position to have a relaxing time. Its greatest assets are its lobby and location. 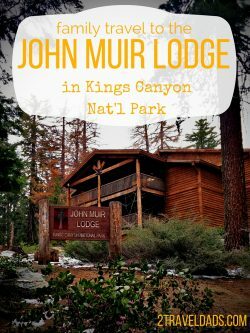 If you’re not camping and want to fully experience Kings Canyon National Park, the John Muir Lodge really is an ideal option. The drive into the Park from areas outside its boundaries is a long and winding one, so we do highly recommend making the most of your vacation time by staying at the John Muir Lodge vs down in the foothills. 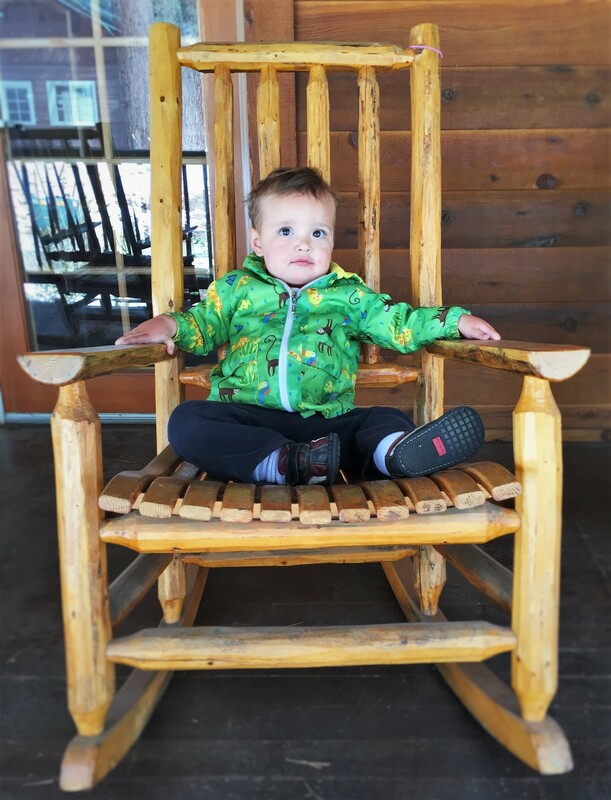 While it may not be the Ritz, it’s a nice and cozy respite in the woods, which is what a National Park lodge is all about. Sorry the late snow messed with your plans but still looks like you enjoyed the beauty of nature!